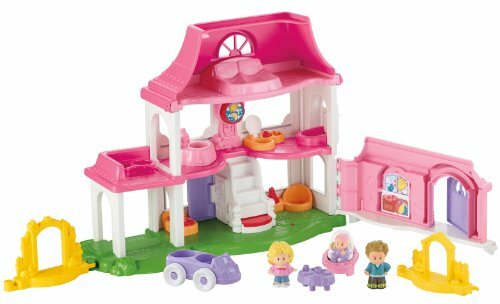 The Little People Happy Sounds Home is a busy, colorful home filled with sounds, just like the real thing, only in this miniature version it’s your child who’s in charge of all the action. And, there’s plenty of it! This Fun Sounds Home has three “floors” so it’s easy for kids to play either sitting or standing. Each area has a “switch” your little one easily activates to hear lots of different songs and realistic sounds. As children move the figures up and down the stairs around and create different stories in every room, they’re improving finger dexterity. Plus, 12 charming sing-along songs in 5 different styles will help them role-play, teach them language and keep them engaged for hours. This home is filled with so much to do and learn! Music and sounds accompany your child’s play in every room! Kids make it all happen just by opening and closing, and pushing buttons. Children will love this toy’s comforting familiarity as they create their own stories and scenes of life with Mom, Dad and Baby. And moving all the different toy pieces will help little hands build finger dexterity and motor skills! This home is filled with so much to do and learn! Music and sounds accompany your child’s play in every room! Kids make it all happen just by opening and closing, and pushing buttons. “Brrrrring”. Mom is in the living room talking on the phone. “Ding-Dong”. Dad goes to answer the front door. “Bubble Bubble”. The bath is ready! “Sizzle! Sizzle!” Something yummy is cooking in the kitchen. The Grandfather clock switches this mini world from the commotion of day to quieter night time. Then, “night time” songs and sounds replace the daytime ones, making the play seem even more real. Children will love this toy’s comforting familiarity as they create their own stories and scenes of life with Mom, Dad and Baby. And moving all the different toy pieces will help little hands build finger dexterity and motor skills! Includes 2 AA (R6) 1,5 V batteries. Please dispose of batteries safely. A Big Busy World of Fun! Open this lovely Little People home and discover a big world of spaces and places to put Mom, Dad and Baby. The front door has a knocker and actually opens and closes. There’s a front window with a shade that flips for different weather days. In the kitchen is a stove with cooking sounds, refrigerator with a door that opens and closes, plus a highchair for baby and a table with food on it for family meals. The living room has chairs for Little People family and friends! On the second floor is baby’s room with a bassinet that plays songs. There’s a bathroom, too, with a bathtub that makes “bubble-bubble” sounds! The third floor is for mom and dad’s bed. When it’s time to travel, there’s a super-cool SUV to take mom & baby about town. And, two fence pieces are included and join easily with other toys that make up the neighborhood. When your child’s busy day is over, everyone heads for bed. But, first, store all the play pieces inside the house for safekeeping, then turn off the toy with a handy on/off switch! The Happy Sounds Home teaches, entertains and best of all, gives little ones the perfect chance for self-expression in a safe and familiar world. As they make up stories and role play, they express their own personalities, feelings and ideas. They also gain a better understanding of how the real world works, whether it’s through learning everyday sounds or singing along with the songs. What a great way to build confidence! Everything in the Little People Happy Sounds Home is designed for little ones and long-time learning. Objects and characters are light and small so they’re easy for tiny hands to grasp. As they move the figures up and down the stairs or place mom and baby in the SUV, they practice dexterity in a fun and familiar way. And with so many catchy songs, as children begin to talk, they’ll love learning all the new words and singing along. Happy Sounds Home–it’s the perfect description! 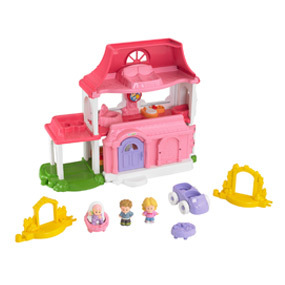 This Fun Sounds Home has three “floors” so it’s easy for kids to play either sitting or standing. Includes table, high chair, SUV and much more! Includes 2 fence pieces that connect to other toys making it easy to extend the play! Each sold separately and subject to availability. On/off switch lets parents control the play!